How to plan and write a narrative story is very important. That’s why we have 15 tips to guide you through how to come up with, not only a well-versed, but also flawless essay narrative and essay writing. The following guide shows the 15 secrets to writing better descriptions to hook your readers from the start to the finish without nodding off. When you write narrative stories, you start by first figuring out what the prompt is asking. Get ideas and do thorough research for more in-depth details. The first step in writing a narrative essay is to have a great idea. Your concept should use dialogue – details to tell about specific events or experience. Ensure you make the reader more interested in what will happen next. Note that a dull narrative leads to an unfinished reading process. Your audience should understand the story from the start or their internal stopwatch will start ticking and immediately write you off. Have you ever thought about a secret, a magic way or a formula to avoid writer’s block? Probably yes. With ideas, you should keep in mind the following five W’S. Outline what you are going to write. It is always a bad idea to write the final copy immediately you come out with a topic. Take down the relevant details and later on pick from them the most important. First, think about the parts of a good narrative. A good story should always have a beginning that introduces the main characters, the setting, and the problem. The middle part has two attempts by the main character and is used to solve the problem that fails. Lastly, the end part that includes a third attempt solves the problem. Separate your paper into three parts. In the beginning write down CSP (Characters, Settings, and Problem). Now, you need to think about the story you are going to tell. Let’s begin by figuring out what the prompt is asking. Think about or imagine an instance you dealt with or you were in and write about it. By looking closely at the last line of the prompt, you can tell that it is a narrative prompt because it is asking you to write about time, or to write about a story. Include the sensory details of sight, touch, hearing, smell, taste, and sight in your narrative in order to invite the reader to feel your experience in real time and visualize in their brains. This helps the reader to accept the flow of the narrative. You want to use exceptional words that precisely capture or hold the experience. Make sure to use adverbs, and adjectives well. Use singular nouns, modifiers, and vivid verbs. Furthermore, check for the overused words. It is good to do a thorough revision to replace. The battalions fought for one week. The was no definite victor. That boy drew a picture by use of markers, paint, and watercolors. Markers, paint, and watercolors are the series of words. Ask yourself these questions after writing your narrative. a. Is my writing easy to read for first-timers? b. Do the sentences start with different words? c. Did you use different sentences? d. Did you include both long and short sentences? a. Did you leave spaces between each word? b. Did you make use of question marks and periods? c. Did you include capital letters in the correct places? d. Did you use a topic/title? e. Is the narrative easy to read by first-time readers? Ensure it is error-free from the start to the finish points. Consider things like capitalization, grammar, punctuation, and spelling, and make sure they are in order. A checklist is used to ensure incorporation of these tips. Having another peer to review your writing is a great idea. He or she gets to see mistakes and errors which are quickly noticed by a fresh pair of eyes. When you revise your document, there are some mistakes that you fail to locate. I order a milkshake with an American muffin. Your ending has a lot of weight as does the introduction. What most writers fail is forgetting to come up with a memorable finish. You need to leave the reader wanting more and wondering when the next chapter or book will come out. 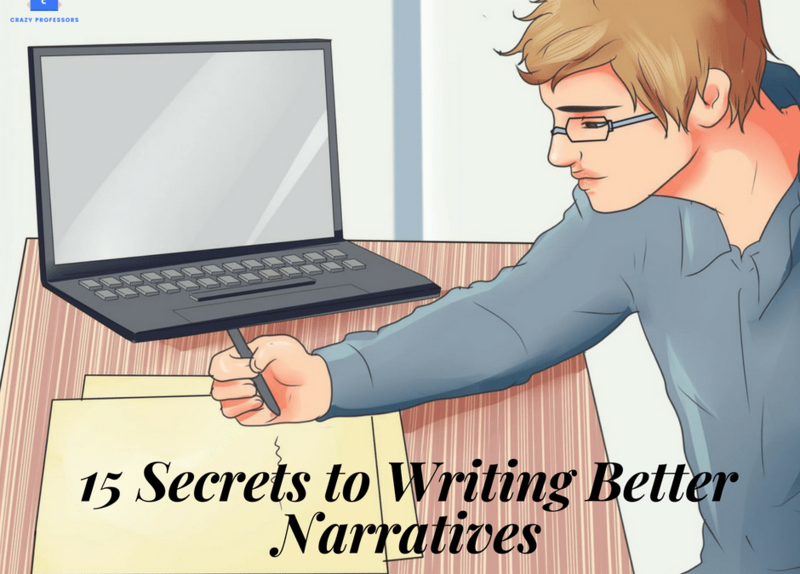 To conclude, writing a narrative essay could be a piece of cake if only you implement the above 15 secrets. Your writing process will become natural, enjoyable, not only to you, but also to your audience as well. Never fail to proofread and replace overused words, which lead to a dull and unexciting read. Strive for the best error-free, and more people will yearn to have a read on what you create.